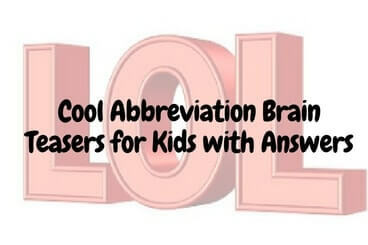 Answers to these abbreviations are given at the end. 1. What am I? English Word Riddles with Answers: These are very interesting Word Brain Teasers. In these Riddles, hints for the smaller words in the given English word are given and your challenge is to guess the English word being talked about in the brain teaser. 2. English Word Puzzles for students with answers: This contains many interesting word puzzles which students will love to solve. 3. English Word Brainteasers with Answers to Test your Mind: Another set of interesting word brain teasers which will challenge your mind. 4. Fun Brain Teasers For Kids, Teens and Adults with Answers to Challenge your Mind: It contains not only the word brain teasers but also Mathematical and Logical puzzles for kids, teens and adults which will twist your mind.